School cases and writing cases, correspondence folders; bags, namely school bags, children's bags, kindergarden bags, bicycle bags, leisure bags, sports bags, travel and flight bags, trunks namely children's trunks and attache cases, rucksacks, satchels namely pre-school satchels, purses worn around the neck, shoe bags (all goods of leather, artificial leather, leather substitute materials, synthetic materials, textile materials). Fountain pens, ball point pens, pencils, crayons, fibre pens, wax crayons, pencil sharpeners, erasers, pencil jars, pencil boxes, staple boxes, school files, folders with elastic bands, ring binders, diaries, notebooks, autograph albums, photograph albums, scrapbook albums, coin albums, stamp albums, writing sets containing writing instruments, namely pens, pencils and markers, and with or without writing paper, painting sets for artists and for children, rulers, desk pads, paper trays, writing and letter paper, exercise books, pads, namely note pads, writing pads and sketch pads, painting pads, note paper and looseleaf paper and gift paper; umbrellas and parasols namely pocket umbrellas, umbrellas for carrying and children's umbrellas. 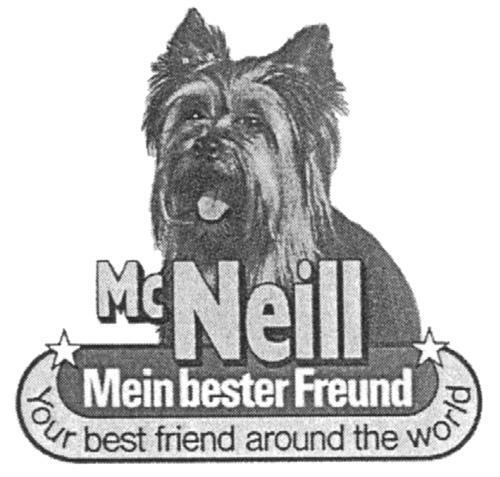 On Tuesday, July 29, 2003, a canadian trademark registration was filed for McNeill with Dog Design by THORKA GmbH Siemensstrasse 28, D-63512 Hainburg, GERMANY . The Canadian IP office has given the trademark application number of 1185940. The current status of this trademark filing is Registration published. The correspondent listed for McNeill with Dog Design is MACRAE & CO. of P.O. BOX 806, STATION B, 222 SOMERSET STREET WEST, SUITE 600, ONTARIO, CANADA K2P2G3 The McNeill with Dog Design trademark is filed in the description of School cases and writing cases, correspondence folders; bags, namely school bags, children's bags, kindergarden bags, bicycle bags, leisure bags, sports bags, travel and flight bags, trunks namely children's trunks and attache cases, rucksacks, satchels namely pre-school satchels, purses worn around the neck, shoe bags (all goods of leather, artificial leather, leather substitute materials, synthetic materials, textile materials). , Fountain pens, ball point pens, pencils, crayons, fibre pens, wax crayons, pencil sharpeners, erasers, pencil jars, pencil boxes, staple boxes, school files, folders with elastic bands, ring binders, diaries, notebooks, autograph albums, photograph albums, scrapbook albums, coin albums, stamp albums, writing sets containing writing instruments, namely pens, pencils and markers, and with or without writing paper, painting sets for artists and for children, rulers, desk pads, paper trays, writing and letter paper, exercise books, pads, namely note pads, writing pads and sketch pads, painting pads, note paper and looseleaf paper and gift paper; umbrellas and parasols namely pocket umbrellas, umbrellas for carrying and children's umbrellas. .
Mark Disclaimer: The right to the exclusive use of the words MCNEILL and BEST is disclaimed apart from the trade-mark. (1) - School cases and writing cases, correspondence folders; bags, namely school bags, children's bags, kindergarden bags, bicycle bags, leisure bags, sports bags, travel and flight bags, trunks namely children's trunks and attache cases, rucksacks, satchels namely pre-school satchels, purses worn around the neck, shoe bags (all goods of leather, artificial leather, leather substitute materials, synthetic materials, textile materials). (2) - Fountain pens, ball point pens, pencils, crayons, fibre pens, wax crayons, pencil sharpeners, erasers, pencil jars, pencil boxes, staple boxes, school files, folders with elastic bands, ring binders, diaries, notebooks, autograph albums, photograph albums, scrapbook albums, coin albums, stamp albums, writing sets containing writing instruments, namely pens, pencils and markers, and with or without writing paper, painting sets for artists and for children, rulers, desk pads, paper trays, writing and letter paper, exercise books, pads, namely note pads, writing pads and sketch pads, painting pads, note paper and looseleaf paper and gift paper; umbrellas and parasols namely pocket umbrellas, umbrellas for carrying and children's umbrellas.